Rural Revolution: How hard can it be? As you may have gathered from my blog post on tire gardening, I’m incredibly excited by the potential for finally growing some decent vegetables this summer. At long last, it seems we may be able to overcome the poor gardening conditions in our little neck of the woods and grow something good. But this project got me thinking. A garden – make that a successful garden – is clearly a critical component on the road to self-sufficiency. Since I didn’t grow up gardening (or canning or milking cows or making cheese or anything else like that), over the years I’ve faced a steep learning curve on nearly every aspect of homesteading. We’ve learned through trial-and-error what works in our area and under our circumstances and within our budget, and what doesn’t. This underscores the importance of starting NOW if you want to strive for a self-sufficient lifestyle. If your goal is to move to a homestead and begin the journey toward food independence, don’t waste any more time – just do it. The reason I say this is because too many people think homesteading is a snap. Eh, how hard can it be? You plant seeds, they grow. In a few months you harvest a bountiful crop and can/freeze/dehydrate it. You get a cow, you milk it. Criminey, what’s the big deal? How hard can it be? This is dangerous thinking. Dangerous and foolish. The pioneers in this country, heading into unknown territory to face unknown setbacks in their quest for independence and self-sufficiency, faced a terrifying amount of uncertainty and unfamiliar obstacles; but at least they were armed with the knowledge how to plant, grow, harvest, milk, preserve, and otherwise survive under primitive conditions. Most people back then did. They had to. If the bleep were to hit the fan, we can’t all mosey down to Home Depot and buy pre-grown hybrid tomato plants. We’d darn well better have a supply of heirloom seeds (preserved from the season before), a place to plant them, the knowledge of how to cultivate them, the understanding of how to harvest and preserve them, and above all the ability to save seeds for the next year. And unless you’re blessed with perfect soil and a temperate and forgiving climate, a garden can’t grow forever in a vacuum. Soil must be amended. Where will you get those amendments? Our endless supply of composted manure is something we take for granted since our livestock creates so much of it; but it’s valuable stuff to those who don’t have critters. The fact is, farming is a complicated and interconnected process. Personally I find it an endlessly fascinating one, but hey, that’s just me. 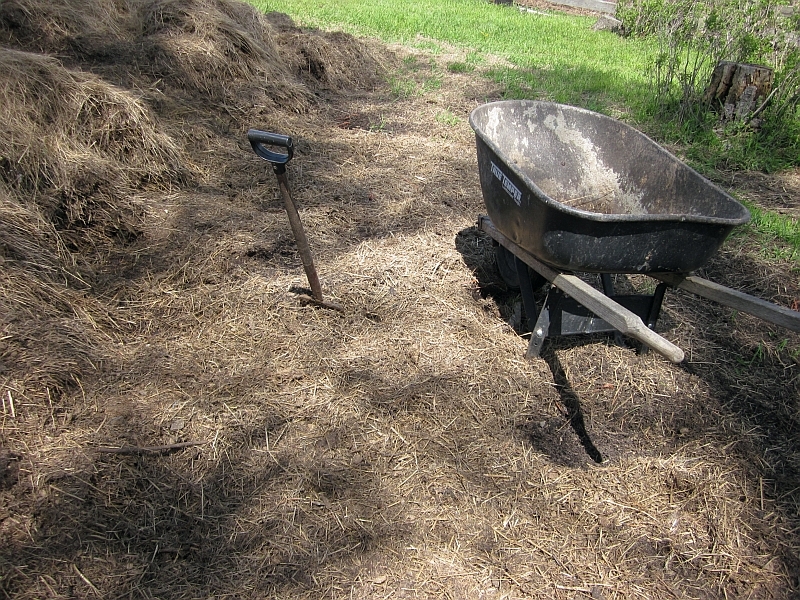 For those who are less enchanted with manure in all its forms, it’s going to be harder to handle homesteading. It’s either comical or depressing (not sure which) whenever I see perky advertisements for urban people to “grow your own food! 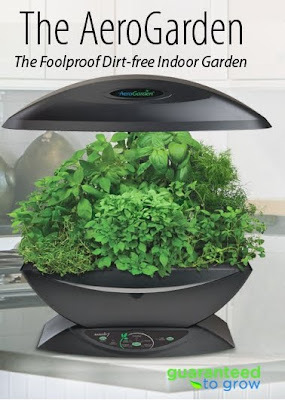 !” and then try to sell these little hydroponic garden kits ("Guaranteed to grow!") that take four months to produce a meal’s worth of herbs. I have nothing against such kits – they’re fun projects for kids – but I have concerns that those unfamiliar with the intricacies of gardening (and the quantities necessary to keep a family in food for an entire year) will come to the erroneous conclusion that planting a windowsill herb box will solve all your food security woes for a year. Or worse, because your windowsill herb box is blooming luxuriantly, you come to the conclusion that you’re a natural and superb gardener. After all, how hard can it be? Folks, it’s just not that easy. In the real world of homesteading, stuff happens. Deer hop fences, wind storms knock down fruit trees, growing seasons can be short, and even grasshoppers can cause untold damage. In short, nothing is "guaranteed to grow." Nothing. We’ve been dabbling with increasing devotion to food self-sufficiency for nearly twenty years now, and we’ve been learning the whole time. Had the circumstances been truly dire, we probably could have compressed those twenty years into three or four (by devoting our every waking hour to the subject), but the fact remains that homesteading ain’t a cakewalk. Even now we’re constantly adjusting our expectations. For example, I don’t know that we’ll ever succeed at having fruit trees. This was a hard reality to accept, especially since our old place in Oregon had dozens of old and established trees (apple, pear, and plum). We took those beautiful trees for granted until we moved here, where the harsh prairie winds, the long winters with deep snow, and above all the hardpan layer about 18 inches below the surface in our area all subtract from the likelihood that any fruit trees will survive. Don’s allowed me one more chance to plant some trees (we’ll punch through that damned hardpan before planting, amend the planting medium, etc.) before giving up. No sense throwing good money after bad. If fruit trees won’t grow, then we’ll concentrate our efforts on small fruits instead. What concerns me are those who people think they’ll wait until AFTER the bleep hits the fan to move rural and learn self-sufficiency... because, after all, how hard can it be? It IS hard. And frustrating. And wearisome. And fascinating. And invigorating. And satisfying. And yes, even thrilling...IF you’re of a disposition to find such things interesting. Tire gardening is as adaptable to urban backyards as it is to north Idaho homesteads. Get some tires, fill them with dirt, and plant something. Lots of things. Line the perimeter of your yard with tires (or raised beds or whatever). Just do it. When those tomatoes or those corn plants or those beans or peppers or peas or spinach or carrots or onions or garlic or broccoli is ready to harvest, learn to preserve them. The conclusion of this rant is this: If you want to live rural, move heaven and earth to make that goal come true, as quickly as you can. Start now. Learn everything you can. But if you’re not all that interested in moving rural (but just sorta kinda think you should for possible “bleep” reasons), then stay put... but don’t waste that backyard space. Start growing some food. Learn what it takes. And never assume homesteading is easy unless you can prove otherwise. Excellent post, everything you have stated is the truth! I live in the same area you do and I have struggled with our short, cold growing season too. I lean toward heirloom seed/plants so I can save seed, but have decided that the trick to gardening with heirlooms is finding the ones that work in YOUR climate. I have found in our area, that most varieties that work well originally come from Russia or the Eastern European countries because they have harsher climates. One variety of tomatoe that has done very well for me is called Stupice (stoo pech key), I think it's a Polish variety. You can get seed from Seed Savers. Gosh. So much in this post I can agree with. Love it! I am trying to turn my black thumb green and I have a long way to go. Have you tried dwarf fruit trees? They may be able to survive your depth problems. I have an orange tree that I planted several years ago. On our last trip I think it looked like it might have grown. It looked different somehow, but it definitely has not been easy. Glad I found your blog. I am painfully aware of how much learning is in front of me. In any endeavor, Murphy's Law cannot be plea bargained with-this has to be taken into account. Your absolutely right, gardening takes time and effort. When it hits the air prime mover, it's to late. I've been gardening in my suburban small lot for five years now. My soil is heavy clay that was part of a monoculture grass farm. It only grew grass well as long as you apply plenty of fertilizer. After two years of an ok garden I went to raised beds with plenty of garden soil and amendments that I added. Now my garden is going crazy. You can see my latest update on my blog, gardenforyourlife.blogspot.com. My garden base mix is from square foot gardening. Now I only have to add poop from my quail, and soon rabbits and occasionally compost that I add in the winter. Even still you can get sudden set backs. My four beds of 5foot all corn was wiped out in a heavy (3") rain storm. I've replanted with beans. Last year it was so hot and dry that my middle crop was a failure even with lots of hand watering. This winter I will rebuild my beds using rot resistant trex boards. Patrice, Being self sufficient and homesteading is not easy as you indicate in your post. There are always ups and downs. There is always something that must be done. Homesteading in my book,is considered more than just a full time job (24/7). If it's something you and your family want, then you must dedicate yourself to complete reseach and make a plan. In fact, I would suggest you read/use blogs from experienced homesteaders such as this blog. Patrice Lewis provides education and solid information to better guide you toward being self sufficient and homesteading. We have been learning some self-sufficiency skills while we've been living in the city. We are now in the process of buying a couple of acres in the country, so we can put what we've learned to better use, and learn more. It won't be a full-scale farm operation like yours, Patrice, but we already have meat rabbits (which we've been raising stealth-style for several years). We plan to get chickens and a couple of dwarf goats. We have dwarf fruit trees in large tubs right now (we can't plant them in the ground here because it holds water), and we'll be planting those and adding to them. I have been learning how to can, and I have a grain mill I need to learn how to use, and I have wheat to learn with. I have a couple of composting bins. I'll confess to not utilizing them much yet, because the yard often has standing water in it. The only place high enough to put them is in the back corner of the yard, where I would have to cross the standing water. Okay, so I've been wimping out. I have a square foot garden, a method I plan to continue using. I think I'll put the corn in the ground next time, though. We've been doing what we can in the city. I could do a lot more if the yard didn't stay wet so much. If your town is good for scrounging, look around for businesses that dispose of their wood pallets for free. Pallets make wonderful compost bins. You could use one for the base and put a screen or a light weight sheet of wood on the bottom pallet, then put four pallets around it. Your compost bin is ready to go and the low areas with water are used effectively. I think another problem that is important is that people understand that KNOWING how to do something is vastly different from DOING it. We've been gardening for years, but I just LOVE it when someone comes over, a person who we know does not garden at all, yet they want to tell us all about how to garden. Not one person on our city block grows their own vegetables, except for us. Sad. It's not as easy as it looks! I can't imagine having to grow a garden to sustain a large family, but I get a good laugh out of those little counter-top garden centers as well. So cute! Great post! I always enjoy reading! There is a line from the movie, "Terms of Endearment." The main character is (spoiler alert) dying from cancer and is telling her husband how to take care of the children when she's gone. He assures her that he can do it, don't worry, I know it'll be hard, but I'm up to the task...yada, yada. My favorite movie line of all time is her response: "As hard as you think it will be, you end up wishing it was that easy." Even if you KNOW homesteading is hard work, until you've done it, you don't know. Whenever I see an ad for some new excercise scam, I scream at the TV: "Save your money! Come to my house and follow me around for a day!" Haha... we've hoed and spaded a garden by hand. Yep, that was hard, for sure! I think you do a great service telling people these things. I use raised beds and last year was my first year of growing anything except tomatoes, pepers and rosemary. My garden was okay last year, but is doing much better this year. Hopefully I will continue to learn and it will improve yearly. I think your tire gardening is a great idea! When my husband was transferred from a city to a smaller town, we assumed that we could have another big yard for growing a lot of our vegetables. We looked at houses for eight hours for one day and found the right one at the sixth hour of the second day. All of the lots were TINY--barely any backyard at all. We could look out of a back window into the back window of the house behind us. We finally found a house on a 90X 92 foot lot. The soil left a lot to be desired, but at least there was space to garden. We have had a large garden and nut trees since the first year. We usually have vegetables, either fresh, canned, or frozen for around eleven months of the year. With a little more effort or a little less sharing with neighbors and friends (which is part of the purpose of growing things) we could probably feed ourselves for the whole year. Our town will not allow chickens which we could work into our yard. If things get really bad I'm inclined toward law-breaking on the subject of chickens. We have put a lot of time and effort into making the soil better but suspect that if we moved that the whole thing would be part of a lawn. Patrice I forgot to tell you about St. Lawrence Nursery in Potsdam, NY. 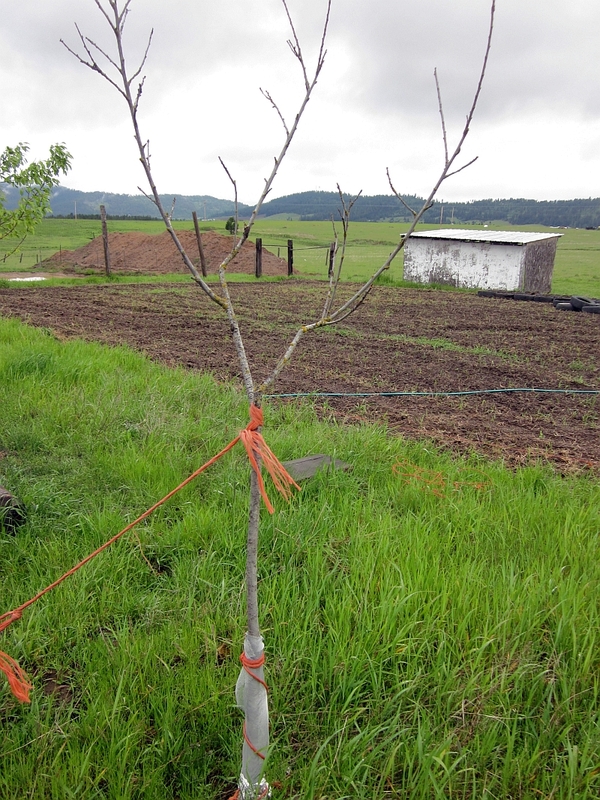 It sells fruit trees that will survive in our climate. They have many heirloom varieties too. OK Girl, my two cents on planting those trees. 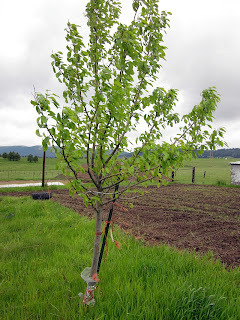 I planted fruit trees in heavily compacted soil that had once been a dirt landing strip for years and the soil never plowed, ever. I found the secret is to get below the hardpan and I found two ways to do it. First you can rent a backhoe and dig deep holes. Then use the loader to mix plenty of your cow pie treasure chest with the soil. Add plenty of calcium sulfate (gypsum) to help break up the hardpan. Other method that worked just as well was to simply use a tractor mount fence post auger to drill to full depth. For each fruit tree I made three 9 inch holes. Then I added soil and amendments to a tractor mount concrete mixer and made my improved soil. The tree roots travel down the boreholes and give you deep rooted trees that are well anchored and able to hunt their own water more easily. And don't leave out the calcium sulfate. By the way, the trees in the old airport runway grew well, made plenty of fruit, and are still producing. Excavation...It's not just for building basements anymore. been homesteading in mississippi for over twenty years and it is still hard...but, it is so worth it too! by the way, i use tires in my raised beds (i just paint them white so they dont get so hot in our hot climate. i even have buckets and pots in the raised bed that are mulched right up to their rims. it works for me...also i have planted and killed off more fruit trees than i care to admit, but the ones that survive and thrive started out in old tires and a bit of tall hardware cloth cages (to protect them from deer and rabbits) around them as well as stakes and rubber hose to keep them from breaking off in our wind shears that we get from time to time. and i have land that has various kinds of soil...so i have things sorta planted in some strange spots. i have never had much luck with tomatoes until i started growing them in buckets and hanging them upside down off of the clothesline poles. learning from our mistakes is key to our staying put. when i need manure, i just hook up the trailer to the lawn tractor and ride out to one of the many pastures to visit the cows and the horses. and while loading the cart up with some manure i usually take a bucket or two and do a little berry picking while out there. to be self reliant a person has to know they are gonna work hard and work smart and there are gonna be some wins and some losses.. This is the first year in many many years that I am not gardening, and it's killing me! We recently moved and we will be in the city for 2 years so my hubby can finish school. A major career change. I miss my garden, it was 3/4 of an acre and we raised more food then we could can, freeze, dehydrate, and eat fresh. It took us about 5 years to find the right heirlooms for our short season. Once we did, the garden produced better then we ever imagined. After my husband graduates, it's back to the country. I have my heirlooms in the freezer and plan to grow a few in pots to keep them viable, not all heirlooms store well for long periods(specifically onions). Have you tried straw bale gardens? They do well and then compost into the ground for next year with a little help from the rototiller. I keep a garden journal to tell me what I planted, when it was planted/transplanted, map of where everything went so I can rotate it, what produced well, what didn't, and what the weather was like. I gave my journal to a friend before we moved, she is just starting to amp up her garden for maximum produciton. She was really happy to have all the info. Being away from my garden for even a few days makes me lonesome. I can't imagine 2 years. The two years will go fast, especially if you spend it planning. Good luck. I forgot to add that I have learned so much from Jackie Clay over the years. Her gardening blog and articles are full of great info. You can google her question/answer pages on backwoodshome. Another idea to find out what grows well is to stop and ask people when you see a great garden or fruit tree. I am a bit shy, but found that everyone I stopped to ask in my former small town was REALLY helpful. The old timers loved to share info and several gave me heirloom seeds they had grown for years. It was pretty neat. Several loved to see a young mom(I don't feel that way, lol) gardening and canning. So they were very helpful and invited my family back to pick fruit once it was ripe. Recently during a casual conversation with an acquaintance, she mentioned her dad had purchased a farm in case TSHTF. She went on to say it's a commercial soybean farm he had bought "in case they need to live off the land." I just smiled and did not say what I was thinking, "They'll be dead within a year if they think they're going to live solely off land that's been used as a commercial soybean farm." Don't forget, even those pioneers, who had the knowledge, died in huge numbers! Stuff happens. Best to start early! We purchased vacant land (7+ acres)last year to build our homestead. 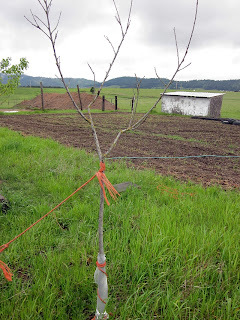 We planted fruit trees last year and had to fence them immediately to protect them against the deer. We prepared the 5000sq ft garden area which started out as raw land. We finished fencing it last week. We also have other growing areas for perrenial fruits, vegtables and herbs. The property already had a well so we purchased a bison hand pump. This week I have had to carry buckets of water daily to water the things that I have planted thus far (tomatoes, peppers, squash, pumpkins, basil, parsley, dill, strawberries, rasberries, and even over a hundred spruce seedlings that we put in and I'm also trying to save a couple of the fruit trees that do not seem to be doing well. I've been using between 30 and 60 gallons of water daily just to give things a small drink. Two days ago I spent 3 hours pumping over 100 gallons of water (over 1000 pumps). 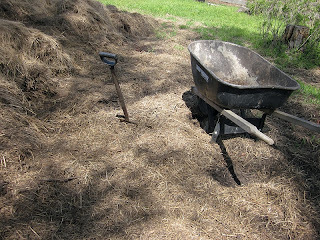 I have mulched many things with straw to help retain moisture. I have also retilled ground to prepare for planting, planted basil, parsley, dill, oregano and squash, moved fire wood (about 8 trips with the tractor), mowed the area which will be our yard when we build. I love doing this. It really is our dream comming true. I'm just reinforcing you point that it is NOT easy. Not only is it hard physical work it takes a lot of time. I have spent 5-8 hours a day working at our homestead this week. Praying for rain in Michigan. Thank You God! We got our rain this morning.